You don't remember exactly when it started, but now you can't make it through a run without that nagging pain in your hip. It came on slowly--at first just an annoying ache. But now, even after icing and soaking and resting, the pain is deep and relentless. So what gives? Given the role of the pelvis as a fulcrum in each of the three planes of motion of the body (frontal, sagittal, transverse), there are numerous potential drivers of alignment issues. Your pain might present as a dull ache on the outside of the leg or you could feel general tightness. The symptoms of pelvic misalignment can take quite some time to show up (and can be quite broad in nature). That's why the condition is often first recognized as a leg-length discrepancy. When the doc tells you one leg is shorter than the other, it's a diagnosis that is addressed as a permanent biomechanical issue when in fact it could be a temporary condition brought on by poor pelvic alignment. Too many folks make the leap to orthotics when appropriate corrective and preventative exercises may address the true issue. It's always a good idea to head to the doctor armed with information and questions. 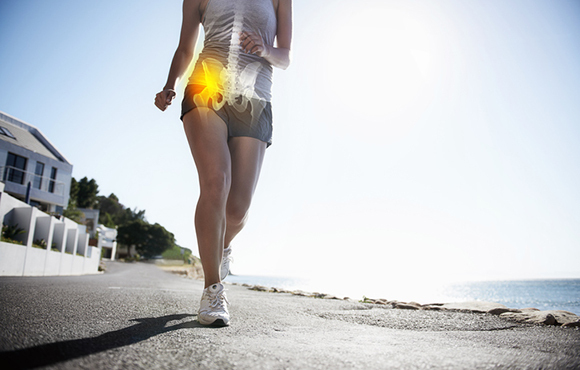 Here, we'll help you understand your hip pain and how your body is functioning so you can recover quickly and get back on the road. Hip alignment is a concern because it--or rather the functional leg-length discrepancy it tends to introduce--is a source of many potential injuries. If you can visualize the impact of running with one leg slightly longer than the other, you may be able to imagine some of the injuries listed below. • Hip injuries or soreness: This seems the most obvious, as the increased force of impact is transmitted all the way up to the hip. • Hamstring strains and piriformis syndrome: The longer leg can end up bearing slightly more of the work in propelling you forward, thus making the hamstring more vulnerable to strains. • IT Band Syndrome: ITBS is seen increasingly as an issue originating from weak hips and glutes, but the increased loads from a seemingly longer leg can have the same effect. • Patellofemoral Pain Syndrome (Runner's Knee): The knee is another joint that bears excessive forces on the longer leg, and can therefore be subject to injury. On the "shorter leg" (lowered side of the hip), which typically ends up experiencing more of a midfoot landing, the most common issue is Achilles tendinitis (or plantar fasciitis). Poor posture: This is a "low intensity, high frequency" contributor that can build over time. It can happen as we sit cocked slightly to one side, when we tend to lean against a counter or table while standing, and while driving--the very nature of having to use one foot can be a factor in misalignment. 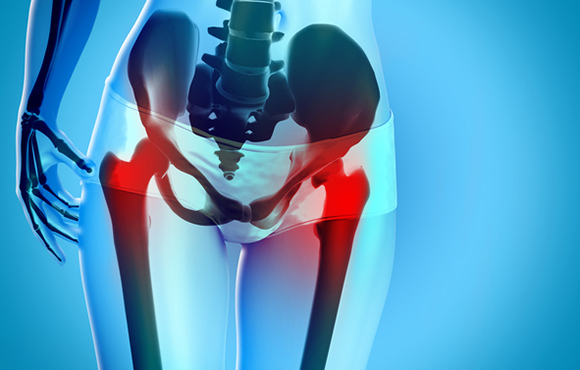 Hip misalignment can best be diagnosed by a professional, who will typically have you relax while lying down with your knees pulled up then extended fully so he or she can see how your knees are positioned. You may also get an indication of this issue if you see different wear patterns on the soles of your shoes. Often the shoe with greater heel and toe wear will be the side that is slightly longer, since it may overextend and lead to more heel striking. Once an alignment issue is identified, the goal is to ease the muscle tightness and imbalances that are causing the problem. This is again most effectively done through at least the initial efforts of a professional such as a sports chiropractor, massage therapist or physical therapist. Massage or active release techniques can help loosen up the muscles most often responsible for the misalignment, like the hip adductors, iliopsoas and the quadratus lumborum. Nice excuse to treat yourself to some relaxation, right? General hip strength and mobility work focused on the hips can help with alignment, too. 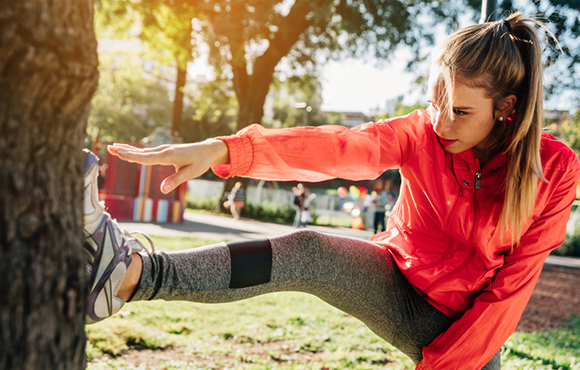 And any of the wide range of stretching activities, ranging from passive to dynamic approaches, can help loosen up the tight muscles driving the misalignment. Forcefully and quickly thrust the foot of the "shorter leg" against the wall, keeping it flat. Push down on your hip on the same side with your hand, and hold the foot against the wall with your hand on the hip for 10 seconds. This is a good exercise to do any time, but particularly as part of your warm-up routine prior to running. Over time, your hip will gradually return to better alignment. 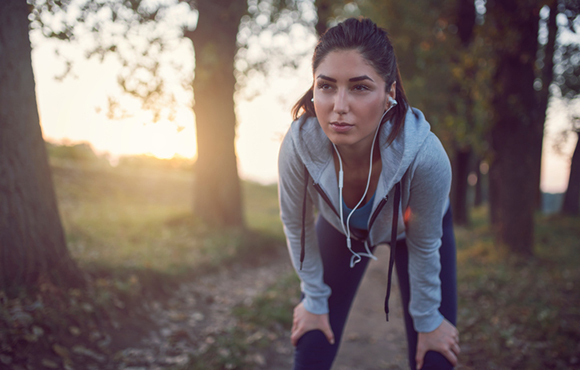 You may notice some change in your soreness patterns as your form corrects itself, particularly if you've been running with the misalignment for some time. Strength training: Single-leg exercises such as pistol squats are particularly helpful for working through muscular imbalances. Regular massage: Prevent muscular tightness from affecting your form by regularly working out adhesions. Run on flat surfaces: This can be tricky, but you should run in the middle of the road when possible. When it's not possible, try to alternate sides of the road when possible. This article first appeared on Predawn Runner.